When Jeremy Corbyn was elected leader of the Labour last September, it became fashionable to describe him as an accidental leader. As I explain in my new book about Corbyn and the leadership contest, Comrade Corbyn, that’s not exactly the case. An unlikely leader; yes. Accidental? Far from it. It was Ed Miliband’s fault for changing the voting system. It was the fault of MPs who nominated him despite not wanting him to be leader. Harriet Harman made a strategic mistake in forcing the shadow cabinet to abstain over welfare cuts. Andy Burnham was to blame, for pandering to the Left. Yvette Cooper should have stood aside for Burnham. It was Tony Blair’s fault. It was Iraq; it was New Labour; it was the expenses scandal; it was the global rise of anti-austerity movements. One senior politician told me he thought there had been a convergence of the stars: the conditions were uniquely right for a candidate of the left, and not just any candidate of the left; this candidate of the left, to triumph. That’s probably closest to my own view: Jeremy Corbyn won for many, many different reasons, all of which proved instrumental in what was one of the most unexpected and exciting political upsets of our era. In my lecture at the London School of Economics on February 3, I discuss many of these factors briefly and focus on one in depth, not because it was any more or less important than the others, but because I think it is both under-reported on and absolutely fascinating: the role of social media. At the start of the 2015 Labour Leadership contest, in the days and weeks after the party’s shocking loss at the general election on May 7 2015, it was not at all clear that a candidate of the left would even stand. Most left-wingers assumed they would be voting for Andy Burnham, who had spent the preceding years quietly wooing the left. After a few weeks however, when, spooked by how poorly Labour had performed nationally, Burnham did a reverse-ferret and began tacking back towards the centre, the left decided he would not do, and the call went out for a genuine candidate of the left. What followed was a series of events which would have been impossible in previous leadership elections, including Ed Miliband’s victory in 2010. 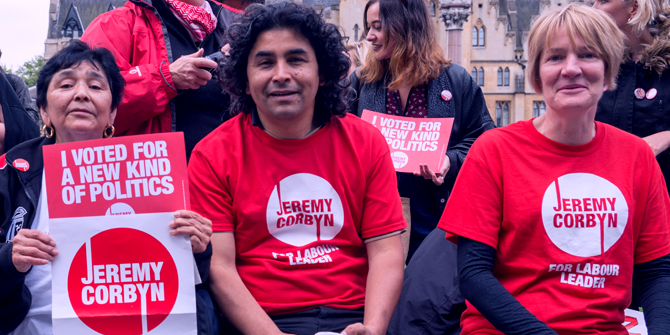 From the comfort of their homes, a number of very ordinary people took to the internet not just to urge a left-winger to stand but to implore, demand and ultimately deliver that person in the form of Jeremy Corbyn. Once he had agreed to put his name forward, they bombarded and all but bullied his fellow MPs into nominating him, and after he was on the ballot they put all their effort into getting him elected. Their contribution to Corbyn’s victory can not be underestimated. Corbyn himself has said that he would not have stood in the contest had he not been inspired by an online petition organised by two women: an aromatherapist from Worthing in Sussex and a mother of four from Tunbridge in Kent. Dozens of MPs have admitted they would not have nominated him had they not come under an online assault from grassroots activists rallied to the cause by another petition, this time organised by an accountant at a Devon meat processing plant. The tactics of these online Corbynistas were planned out with an efficiency and dedication his rivals could only watch with envy, by a teacher from Lancashire. I spoke to some of these social media activists and they all said the same thing: they were Labour voters but had never done very much on a formal level within the party. To this day they have never met or even spoken on the phone. Yet thanks to the internet, from the comfort of their living rooms, they were able to gather together to help achieve a remarkable thing: the election of the ultra-left-winger Jeremy Corbyn as leader of the Labour Party. Rosa Prince is a writer and journalist covering UK and US politics. 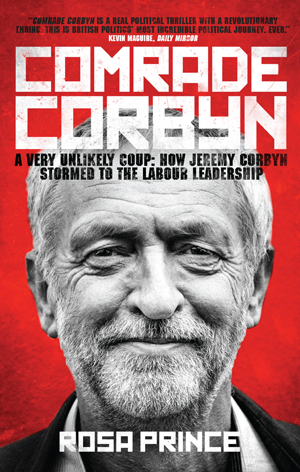 She speaks about her new book ‘Comrade Corbyn, A Very Unlikely Coup: How Jeremy Corbyn Stormed to the Labour Leadership’ at an LSE public lecture on 3 Feb – part of the LSE Department of Government’s BritishGovernment@LSE series.